Lord God, who chose Saint Luke to reveal by his preaching and writings the mystery of your love for the poor, grant that those who already glory in your name may persevere as one heart and one soul and that all nations may merit to see your salvation. Through our Lord Jesus Christ, your Son, who lives and reigns with you in the unity of the Holy Spirit, one God, for ever and ever. St. Luke, the inspired author of the third Gospel and of the Acts of the Apostles, was a native of Antioch in Syria and a physician, and one of the early converts from paganism. He accompanied St. Paul on a considerable part of his missionary journey. He was also his companion while in prison at Rome on two different occasions. His account of these events, contained in the Acts, is firsthand history. St. Luke came from Antioch, was a practicing physician and was one of the first converts to Christianity. He accompanied St. Paul, who converted him, on his missionary journeys and was still with him in Rome when St. Paul was in prison awaiting death. We hear no more of him afterwards and nothing is known of his last years. The Church venerates him as a Martyr. St. Luke's Gospel is principally concerned with salvation and mercy; in it are preserved some of our Lord's most moving parables, like those of the lost sheep and the prodigal son. Dante calls St. Luke the "historian of the meekness of Christ." It is also St. Luke who tells us the greater part of what we know about our Lord's childhood. "According to tradition he was an artist, as well as a man of letters; and with a soul alive to all the most delicate inspirations, he consecrated his pencil to the holiest use, and handed down to us the features of the Mother of God. It was an illustration worthy of the Gospel which relates to the divine Infancy; and it won for the artist a new title to the gratitude of those who never saw Jesus and Mary in the flesh. Hence St. Luke is the patron of Christian art." -Excerpted from The Liturgical Year, Abbot Gueranger O.S.B. St. Luke did not personally know our Lord, and like St. Mark, the author of the second Gospel, he is not included among the apostles. For this reason the Gospel chosen for their feast is the account of the sending forth of the seventy-two disciples. According to St. Jerome, St. Luke died in Achaia (Greece) at the age of 84, and it is unknown whether or not he died a martyr's death. His name means "bringer of light" (= luke). Patron: Artists; bachelors; bookbinders; brewers; butchers; glassworkers; goldsmiths; lacemakers; notaries; painters; physicians; sculptors; stained glass workers; surgeons. Symbols: Winged ox; winged calf; ox; picture of the Virgin; palette and brushes; phials of medicine; physician's robes; easel; book and pen; hatchet; wooden horse; books of his Gospel and of the Acts; bishop; painting an icon of our Lady. Read the Acts of the Apostles. St. Luke accompanied St. Paul on his missionary journeys — we could spiritually adopt a missionary and accompany him or her with our prayers. See St. Luke, Evangelist and Artist for some excellent ideas on how to incorporate this feast into your family life. St. Luke depicted Mary vividly in words. Learn and pray the three precious canticles preserved for us by him — the Benedictus, the Magnificat, and the Nunc Dimittis. Pray for doctors and those who care for the sick through the intercession of St. Luke, patron of physicians. 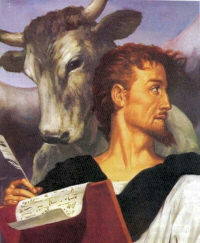 Foods this day to honor St. Luke would include some beef dish, as he is known as the "ox" and is the patron of butchers. For dessert, bake some raisin Banbury Tarts to evoke the festivals of England on this day, or a cake in the shape of a book with decorations of a calf or ox for this evangelist. Today is also known as "Sour Cakes Day" in Scotland, because baked cakes were eaten with sour cream in Rutherglen. Around this feast is known as "St. Luke's Little Summer," a period of summer-like days that occur around October 18 named to honor the saint's feast day. It's similar to the the term "Indian Summer," which officially occurs between November 11-20). St. Luke gives us some golden days before the cold of winter. Read more about St. Luke and his writings from the Catholic Encyclopedia.